Seagoing vessels can be dangerous, and overboard accidents happen far more often than they should. Just within the cruise ship and ferry industries, there were nearly 300 overboard accidents between the years 2000 and 2016. Defective handrails. 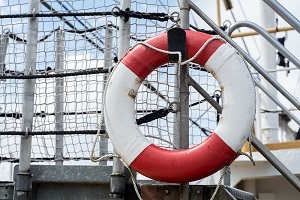 If a ship possesses handrails that are of an inadequate height or defective, and a crew member or passenger falls overboard as a result, the company may be held liable. Dangerous pathways. Narrow staircases and slippery corridors can easily cause slip and fall accidents, and these mishaps can in turn lead to a crew member or passenger falling overboard. Failure to warn of rough conditions. When a storm approaches while at sea, the ship’s deck officers have a duty to warn other crew members and passengers of the impending danger. Weather conditions frequently deteriorate rapidly, and the vessel operator may be held liable if crew members or passengers who haven’t been warned of the danger fall overboard. Intoxication. Crew members should not continue to serve alcohol to intoxicated passengers. When a passenger is overserved, the ship’s operator must ensure that he remains safe while he is intoxicated. Should this passenger fall overboard, the company may be held liable. Failure to conduct rescue operations. When a passenger or crew member goes missing, the ship operator is obligated to conduct a search and rescue operation. Should it fail in this duty, the company will be liable for the injuries or death of the missing crew member or passenger. Crew members and passengers who fall overboard face drowning risks, hypothermia, injuries caused by propellers and other moving parts, shark attacks, and traumatic injuries caused by the fall itself. If you’ve been injured or lost a loved one due to an overboard accident, you need an experienced maritime attorney to help you receive the compensation you deserve. To learn more about what the law offices of Steve M. Lee, P.C., can do for you, visit us on Facebook.